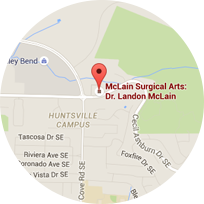 Dr. McLain corrects aesthetic irregularities in the nose by manipulating bone or cartilage. He may graft these tissues to improve nasal function, promote long-term strength and minimize age-related changes to the nasal tip. He may also straighten your nose or remove scar tissue resulting from trauma in order to restore breathing function. Dr. McLain may recommend combining additional face procedures such as chin augmentation or fat transfer with rhinoplasty to improve facial proportion. Depending on your needs, Dr. McLain may perform either an open or closed rhinoplasty procedure. Dr. McLain typically recommends an open approach, which involves a small external incision in the columella (the flesh between the nostrils). This incision heals wonderfully and generally becomes imperceptible with time. The open approach allows for the most precision in operating on the underlying nasal skeleton. Open rhinoplasty also creates the best opportunity for grafting if needed. In cases that only require minimal tip work or hump reduction, Dr. McLain may recommend a closed approach. This technique requires only incisions made entirely inside the nose. Dr. McLain is also experienced with revision rhinoplasty to correct the results of prior rhinoplasty procedures. Revision rhinoplasty patients may wish to improve their cosmetic results, and some may have post-surgical breathing problems. Secondary surgery can address these concerns. I’ve heard rhinoplasty recovery is painful. Is that true? Not usually. In fact, Dr. McLain’s patients are often pleasantly surprised that their recuperations are much more comfortable than they anticipated. This is due to the fact that most patients do not require intranasal packing. However, soreness is common for about a week after surgery, and Dr. McLain advises patients to keep their heads elevated to reduce excessive swelling. He also prescribes medications to enhance your comfort. You may also experience a mild headache and a sense of nasal congestion for some time, but most people get back to light activities within just a few days. How likely is it that I’ll need a revision rhinoplasty? Patients request revision rhinoplasty when they’re unhappy with the results of their original procedures. Although undergoing a second surgery isn’t unheard of, choosing the right surgeon before your first surgery can reduce the risk of an unfavorable result. Dr. McLain’s board certifications in both cosmetic surgery and oral and maxillofacial surgery ensure that he understands the anatomy and function of the nose as it relates to the rest of the face. He listens to the desires of his patients and uses his established sense of aesthetics to create results that balance the face and look natural. It depends. Insurance companies sometimes cover “functional” rhinoplasty procedures that aren’t done for cosmetic reasons. If you have a documented history of chronic nasal obstruction due to a physical irregularity, such as a deviated septum, your private insurance may cover at least part of your surgery. If you’re undergoing rhinoplasty for purely aesthetic reasons, it’s unlikely to be covered. Dr. McLain and his team are happy to help you work with your insurance provider to find out exactly what your plan includes. We are also pleased to provide financing options to help all our patients access the procedures they desire. To learn more about your options for paying for your procedure, visit our Fees & Financing page.